I'm in SF and I'm looking for a home for my two babies, they are both adults and mates, Chulo was in a very bad condition when I found him, not able to stand by himself it was very bad but he is a normal bird now, he had been with me for a long time now, then I found Geneva in my back yard, she was not able to fly and was crashing with the paviment and go backwards, anyways we took her to the vet and couldn't say exactly what she got, anyways in the mean time Geneva and Chulo fall in love, Geneva looks like a normal bird sometimes when she is scare doesn't fly that well, but normally she does, other than that they are both fine..
Now I need a home for them here in CA I don't mine to drive and take them to a nice home with more birds will be the ideal. Please let me know if someone here is interested. I'll take them to the place, I also want to make sure that they will be in good hands and spoil like they are now. Gee it will be nice seeing pics of them. It was wonderful of you to help them back to health. How long have you had Geneva? What was the problem with Chulo? I sure hope you find a good home for the two of them. And welcome to Pij-N-Angels. I am sending positive thoughts and prayers for a special forever home for this sweet couple! So Ivette...you don't know for sure they are PMV survivors, you just suspect that...right? At the time you received each, did the vet check their poop for bacteria right away? About how long have they been in your care? Thank you so much for posting the pictures Jenn, I found Geneva on Feb 20th, around that time, I don't know how she came to my back yard because she was not able to fly, every time she was trying she was crashing on the paviment, I posted on PT as a very strange condition, Chulo had been with me for a really long time, he was different he had PMV and had seizures very constantly, and couldn't hold his head straight at all, but Chulo es the one that look bigger, he is very active and spoil, didn't show any symptoms any more. Geneva is flying very good now, she was on cipro for over than a week, sometimes if she feels scare she can show something of her illness, but not very often, they are both very active and fly all over the house she doesn't want to sleep in the cage anymore, and I only have one cage, and 3 birds.. so you can imagine how I get complaints all the time, and they need a bigger space probably with other pigeons will be the best. I can drive any distance around California or some other place close. I didn't take Chulo to the vet, but I read everything about PMV and he present the same symptoms, with Geneva I'm not sure, George went to the vet and she gave him different possibilities because the symptoms were different but we didn't do any test, just to visit the vet was $100 so I couldn't spend more to do other test. Geneva is much better, but you are right she probably had something different but now she is just doing well, hard to say what it was, Phil said that could be PPMV, but again it was a mistery. My worry with saying that a bird has PMV when it hasn't been varified, is that there are many other illnesses that are often mistaken for PMV and therefore never treated. Neurlogical symptoms in Pigeons can be caused by spoiled seed,fungus, bacterial infections, toxins, the ingestion of lead or metal, parasites, dehydration and several different viruses including PMV. I understand that we have been conditioned to think of PMV first when we see a bird convulsing or with the neck contorted or crash flying but when we see that, it may not be PMV at all. As best I can, I would like to change that perception for the good of the Pigeons we love and want to help. I know it can be crazy expensive to take a bird to the vet and as some of us just seem to be sick Pigeon magnets, there is always another Pigeon that finds us and needs help. The best is to develope a relationship with a vet that is willing to examin Pigeon's poop and tell us what they see. They can't by law, sell medications unless the actually examine the Pigeon but if medication is needed, finding it is not all that difficult. I honestly didn't mean to high jack your thread, Ivette. To be true to myself, I needed to say what I did just now. I appreciate your kind heart and all you do for the creatures you come across that need help. You are one in a million. I hope we can find a good home for Chulo and Geneva. I love their picture. 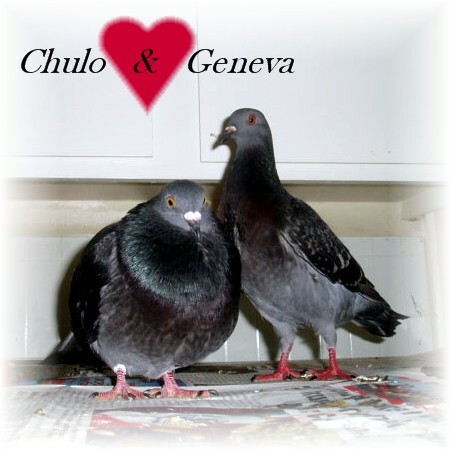 Chulo and Geneva are very pretty birds, Ivette. I wish the best for both of them. Thanks for posting their picture, Jenn. I'm having too many problems at home because the pigeons, and is hard for me to leave them out there when I find them sick, George takes the pigeons most of the time but sometimes he is busy and can't take more birds, and believe me not that many people have the time or space for them, I live in my uncle's house, I rent a portion of his house, but I understand that he doesn't want me to keep them and to have more birds, I can't release them because I'm afraid that something else can happen out there or can come back to them the same illness. Like I said I'm just tired about hearing every day the same song, when are they leaving, if I was leaving by myself I'll keep them, but that is impossible right now, having my own place here in SF is just a dream right now, they all get fine and didn't see any contagious from anything, they all eat in the same plates and drink the same water. I don't have that many friends here that are into pigeons or animals except people from PT or PA, I don't know any vet, George is the one that knows the vet but even that he always pays when he visit her. Anyways, if someone will like to have these babies and care about them, I'll really appreciate it please let me know. They're very pretty. I hope you find them a home. It's unfortunate that you are having these problems and I hope very soon that you find a wonderful home for these two. I wish we could help you but we are in thew midwest. Thank you Robin, I appreciate your words.